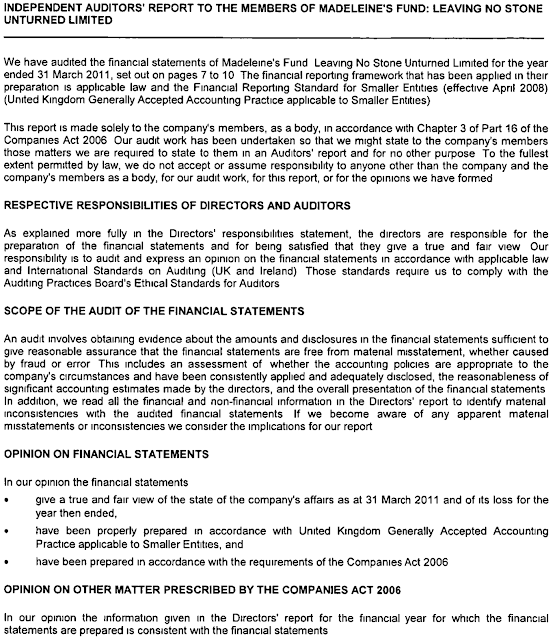 This 24-pages document was filed on December 21, 2011 at the Companies House. 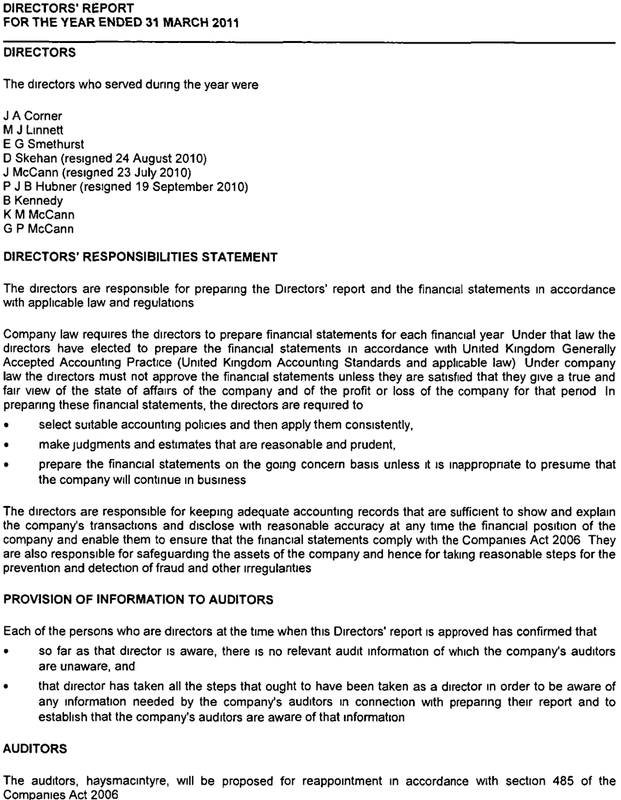 Pages 1 to 11 have a similar text and the signatures of the current directors [except Edward Smethurst's signature] approving a “Special Resolution” (sic). From page 12 to 24 follow the amended articles of the “Foundation” (sic), that is, of Madeleine's Fund Leaving No Stone Unturned Limited. 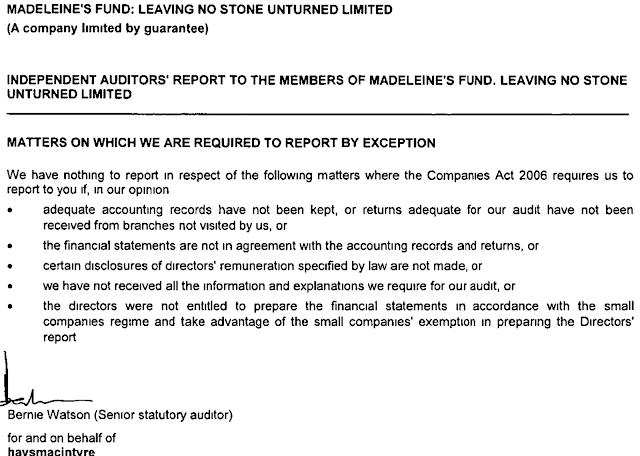 On January 8, 2012 the private limited company full accounts [up to March 31, 2011 - without Kate McCann's book royalties & book deals] were made available at the Companies house, the stamp on the first page indicates they were filed on December 30, 2011. 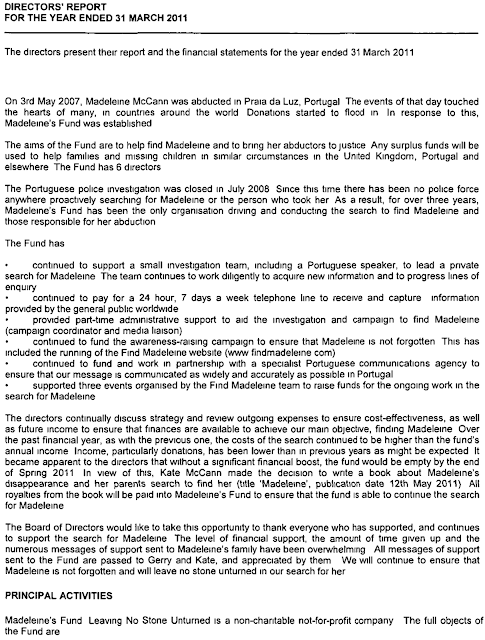 Since yesterday several UK newspapers have been reporting spinning on the Fund “dwindling donations”, seemingly oblivious of the amendments to the Articles of the company and despite their obvious significance; adjustments which effectively ensure the McCann couple & associates will now have a quasi “carte-blanche” regarding the use of the Fund's donations. 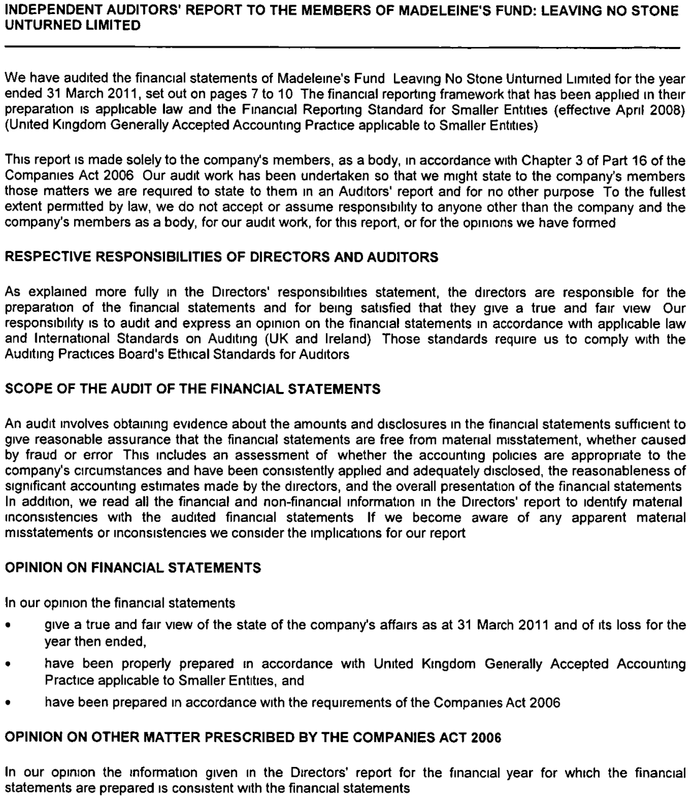 Amendment to the “Amendments”: It seems almost all of the Articles listed bellow give an identical level of financial control over the fund's assets and have been present in the Company's statutes since its incorporation date on May 15, 2007. The most interesting change is the complete removal from the Fund's objects of an article that has appeared in all the Accounts (including in the latest) and Articles for the years of 2007, 2008, 2009, 2010 & 2011 - “To provide support, including financial assistance, to Madeleine's family”. Which raises at least one question: “What happened around November 29, 2011 that made the fund directors circulate an amendment to remove that article in particular?” Is it a mere case of excluding a superfluous article or could there be something else behind this modification? Pursuant to Chapter 2 of Part 13 of the Companies Act 2006 (the "Act"), the directors of the Company propose that the following resolution be passed as a special resolution (the "Resolution"). That the amended articles of association attached to this written Resolution be and are hereby approved and adopted as the articles of association of the Company in substitution for and to the exclusion of the existing articles of the Company. Before signing you agreement to the Resolution, please read the notes at the end of this document. We, the undersigned, a member entitled at the time the Resolution was circulated to attend and vote on the Resolution at a general meeting of the Company, HEREBY IRREVOCABLY AGREE to the Resolution being passed as a special resolution. 2.1 Unless the context otherwise requires, words or expressions contained in the Articles bear the same meaning as in the Act but excluding any statutory modification thereof not in force when the Articles become binding on the Foundation. 2.2 Subject to Article 2.1 any reference in these Articles or the Memorandum to an enactment includes a reference to that enactment as re-enacted or amended from time to time and to any subordinate legislation made under it. 2A. The registered office of the Foundation is situated in England. 2B.1.2 To procure that Madeleine's abduction is thoroughly investigated and that her abductors, as well as those who played or play any part in assisting them, are identified and brought to Justice. 2B.2 If the above objects are fulfilled then the objects of the Foundation shall be to pursue such purposes in similar cases arising in the United Kingdom, Portugal or elsewhere. 2C.30 do all such other lawful things as shall further the Foundation's objects. 2D.3 The restrictions on benefits and remuneration conferred on members of the Foundation and on the Directors by Article 2D.2 and the exceptions to such restrictions in Articles 2D.2.1 to 2D.2.7 inclusive shall apply equally to benefits and remuneration conferred on members of the Foundation and on the Directors by any Subsidiary Company, and for this purpose references to the Foundation in Article 2D.2.2 shall be treated as references to the Subsidiary Company. 2D. The liability of the members is limited. 2E.3 for the adjustment of the rights of the contributories among themselves. 2F. If any property remains after the Foundation has been wound up or dissolved and the debts and liabilities have been satisfied it may not be paid to or distributed among the members of the Foundation, but must be given to some other institution or institutions with similar objects. The institution or institutions to benefit shall be chosen by the Directors at or before the time of winding up or dissolution. 3. The Directors from time to time shall be the only members of the Foundation. A Director shall become a member on becoming a Director. A member shall cease to be a member if he or she ceases to be a Director. Membership shall not be transferable and shall cease on death. 4. There shall be at least three Directors following appointments to be made by the first Director. 8.7 he or she ceases to be a member of the Foundation. 9. 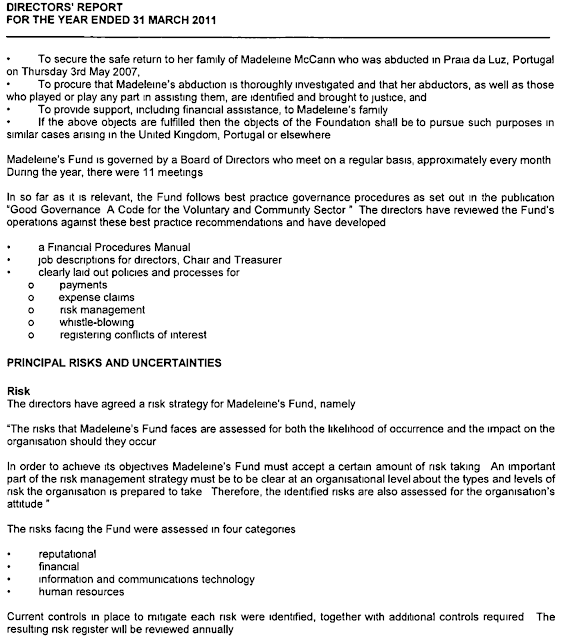 Subject to the Act, the Memorandum and the Articles, the business of the Foundation shall be managed by the Directors who may exercise all the powers of the Foundation. No alteration of the Memorandum or Articles shall invalidate any prior act of the Directors which would have been valid if that alteration had not been made. 10. The continuing Directors or a sole continuing Director may act despite any vacancies in their number but while there are fewer Directors than required for a quorum the Directors may only act for the purpose of increasing the number of Directors. 12. 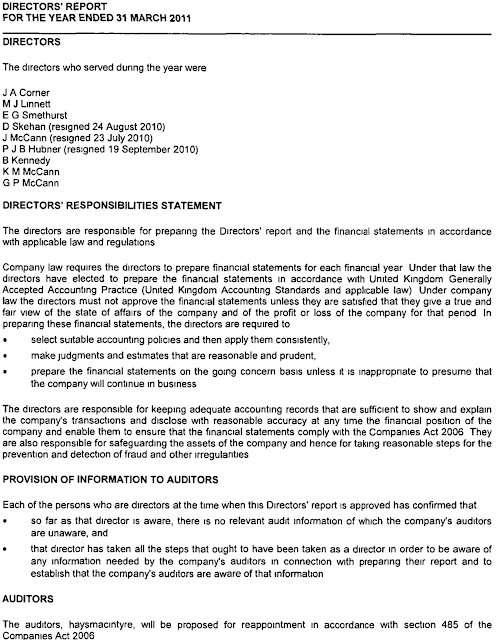 Subject to the Articles the Directors may regulate their proceedings as they think fit. 13. The Directors may appoint one of their number to be the chair of the Directors and may at any time remove him or her from that office. 14. The Directors may by power of attorney or otherwise appoint any person to be the agent of the Foundation for such purposes and on such conditions as they determine. 15. The Directors may delegate any of their powers or functions to any committee or the implementation of any of their resolutions and day to day management of the affairs of the Foundation to any person or committee in accordance with the conditions set out in these Articles. 36. No objection shall be raised to the qualification of any voter except at the meeting or adjourned meeting at which the vote objected to is tendered, and every vote not disallowed at the meeting shall be valid. Any objection made in due time shall be referred to the chair whose decision shall be final and binding. 38. No Director shall be regarded as having a conflict of interest solely because he or she is also eligible to receive the support of the Foundation. 49.2 against all costs, charges, losses, expenses or liabilities incurred by him or her in or in relation to the proper execution and discharge of his or her duties. 50. The Directors shall have power to resolve pursuant to Article 2C.29 to effect directors' indemnity insurance, despite their interest in such policy. 51. The provisions of clauses 7 and 8 of the Memorandum relating to the winding-up or dissolution of the Foundation shall have effect and be observed as if the same were repeated in the Articles.